Essentially, the battle between swag and class has nothing to do with a person’s character. Being a gentleman is not defined by your choice of clothing. 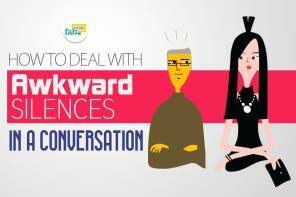 It is your mannerisms that make all the difference. Yet, being stylish hurts no one. The charm of a suave look is essentially derived from a tuxedo, which can complement your looks provided you know how to tie a bow tie. Bow ties have exuded class and sophistication since they came into existence. Its origin goes way back to the 1700s, when Croatian mercenaries wore cravats to bind their shirt collars. Later, the French aristocracy adopted it, and years of evolution turned it into the necktie and bow tie of today. Yes, pre-tied bow ties and clip-ons are available in the market, but their perfect knots and symmetry undermine the sophisticated look that you intend to achieve. Unlike a clip-on or a pre-tied bow, the slight crookedness of the knot and the lack of symmetry is the true nature of a hand-tied bow tie, which makes it even classier. To avoid a major fashion faux pas, here's how to tie a bow tie yourself in 40 seconds. Go stand in front of a mirror if you want to do this right. Start by buttoning the collar and unfolding it. Now, place the tie around your collars that one end of the tie is 1½ inches longer than the other. The longer end of the tie should be on the side of your dominant arm, on the right side if you are right-handed and on the left side if you are left-handed.Cross the long end of the bow tie over the short end. Now, pull it tight under your neck like a basic overhand knot. Make sure that the knot is directly over the collar button and is tight enough to stay in place. Place the longer end of the bow tie over your shoulder. You won’t need it for the next step. Place your index and middle fingers on the top and back sides of the bow tie, respectively. Use your middle finger to fold the bow from the back on top of your index finger and make a half bow. Hold the half bow over the neck horizontally. Keep holding the half bow with your non-dominant hand, and bring down the long end of the bow tie that was on your shoulder over the top of the half bow. If you like a twisted knot in your bow tie, just make a small change. Rotate the longer end once while bringing it down. It will form a twist in the fabric in front of the half bow. Fold the bow pull it forward to make a small opening behind the half bow. The opening is below the long end of the bow tie and above the overhand knot at the origin of the short end or the half bow. Stick your thumb into that opening and fold the bow the other way. Make an additional half bow with the long end by folding it into a bow using your index and middle fingers. Now, insert the second half bow behind the first half bow through the opening where your thumb is. You must first insert the point of fold of the second half bow. Pull the opposite ends of first and second loops to adjust the tightness of the knot. Initially the bow tie may look odd. It requires a little bit of adjustment before you have the final look. If you like a big, wide knot at the front, just keep things loose. While inserting the second half bow behind the first half bow, do not push in tightly. While adjusting, just pull enough of the opposite sides to get the shape of the bow, and not tighten the knot. 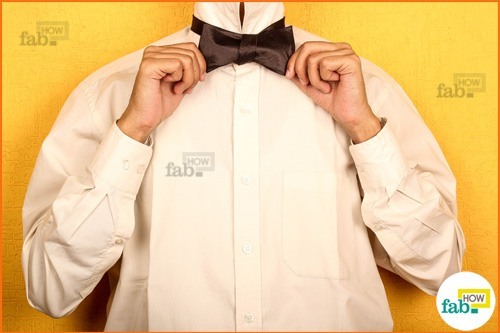 Now, fold your collar down and enjoy the suave look of a bow tie. To avoid any mistakes, stand in front of a mirror. 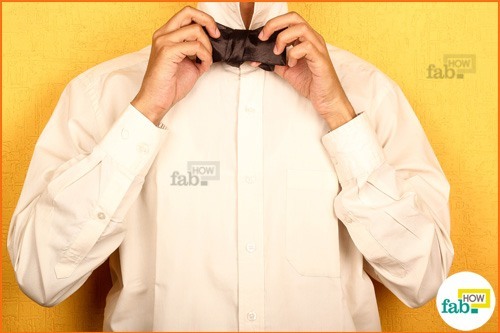 Now, fasten your collar button, unfold the collar and place the bow tie around it. Remember, one end of the tie should be1½ inches longer than the other. Keep the long end of the tie on the side of your dominant hand. If your dominant hand is your right hand, then the longer portion must be on the right side and vice-versa if you are left-handed. Place the longer part of the bow tie over the shorter part like an “X”. Pull out the longer part from under the shorter part in the center and under your neck like an overhand knot. Keep in mind that the knot must be right on top of the collar button and adjust the tightness now. Place the longer end over your shoulder. You won’t need it for the next step. Place your index and middle finger on the front and rear portions of the bow, respectively. Use your middle finger to fold the bow from the rear to the front side and make a loop or half bow. Pin down the half bow over the neck in a horizontal position. While holding the half bow, bring down the longer part of the bow tie over the top of the half bow. Make a loop in front of the by wrapping the longer on the half bow. To do that, fold the half bow with your non-dominant hand and take the longer part up from behind the half bow. Make a second half-bow from the longer end by folding it into a bow. Insert the finger of your non-dominant hand in the loop at the front. Now, insert the second half bow in front of the first half bow through this loop. First insert the point of fold of the second half bow. To adjust the symmetry and structure of the knot, pull the bow tie from the opposite ends of the first and second loops. After a few seconds of adjustment, the proper shape of the bow tie will be visible to you. Don’t fret over the symmetry. Askew bow ties are perfect and give you a debonair look. Now, lower your collar and see for yourself the elegant look of a bow tie. Do not wear a clip-on or pre-tied bow after you have graduated from high school. They are for younger men to wear. It is essential that you use a mirror for tying a bow tie and is especially helpful when you fine tune the shape of your bow at the end. Although length is a personal choice, the recommended length of a bow tie is 2 x Neck Size + 2 inches. Buy a bow tie with a length adjustment buckle to easily get the desired length. To adjust the shape of the bow tie, remember you have to pull the opposite ends of the different loops. While tying a big or wide knot, tie the last loop gently and adjust the bow in a subtle manner so the knot doesn’t tighten and become smaller.